Burying the EM compost in unplanted ground. Burying the EM compost when planting potatoes. Burying the compost when plants are already in. Dig Ditches 20-30 cm deep and 30 cm wide. 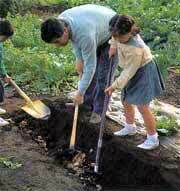 Dig Ditches leave 30 cm gap each side of potato then add compost as before and cover with soil. Allow a 30 cm from new plants. Pour out the compost and spread to about 2.5 cm deep. Potato. Right side uses chemical fertilizer. Left uses EM garbage compost. The right was planted one week before the left. 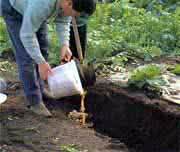 Mix the EM compost with the soil and cover with about 10 cm of soil. Mix the compost with the soil. The size of the left stem is bigger than the right. How is the EM garbage compost after 2 months? Then cover with the soil. There is more harvest on the left hand side and it tastes better. Turning into soft soil. No foul odur.